Ritornano i concerti del giovedì di Radio Blackout 105.250! dalle 22.30 / benefit libere frequenze / Blackout House, Via Cecchi 21/A, Torino. 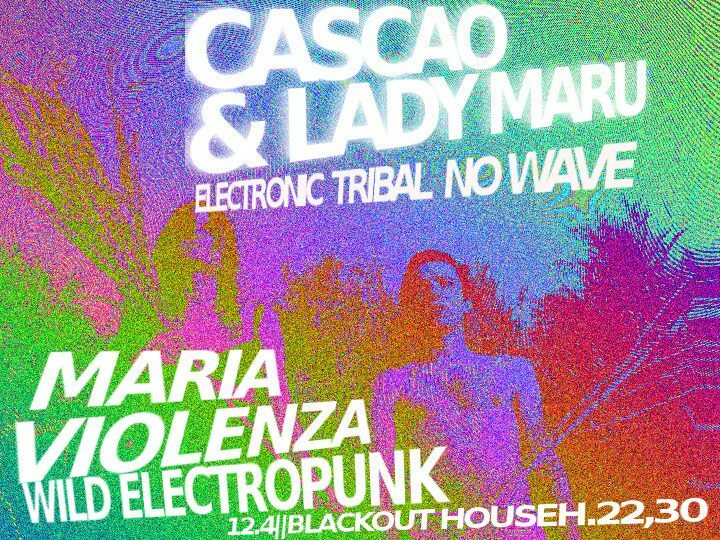 Cascao & Lady Maru are a no wave/electro duo emerging from the no-wave/punk scene of the aethernal Rome. Their new album Spleenism was announced for a September 18th release date on Cochon Records. The album combines pop elements and tribal funk rhythms among an atmosphere that veers dark. Cascao works as a sound engeneer, a producer and a theater actor, and has been playing in various no-wave, post punk, noise and electronic projects of the freaky Roman underground scene, whereas Lady Maru is a techno and house DJ who has been touring around with her no wave bands like Dada Swing, Trouble vs Glue, and others. They started their work together in 2008, evolving their partnership into a head-turning live act, with guitar, synth, some live samples and percussion, brought together with poppy, arty melodies. They aren’t shy to evoke the influence of Talking Heads, The Residents, and the proto-70s and -80s no-wave eras. 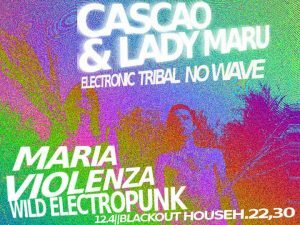 Sicilian born, Rome-based Maria Violenza plays dark arabesque synth-punk music under the influence of her homeland’s mixed cultural heritage. Let’s search for Sicel, Sicanian, Phonenician, Greek, Punic, Roman, Vandalic, Gothic, Byzantine, Arabic, Jewish, Norman, Lombardic, Spanish, Albanian and North-African elements in her music!